Whatever you prepare this coming week for your Thanksgiving feast, be sure to include a beet dish. Please avoid the canned or jarred variety as this simply does not come close to sweet, aromatic, freshly roasted beets. Try roasting them in olive oil along side similarly sized cut carrots and red onion. Then dress with a bit of good quality extra virgin olive oil, balsamic, salt, pepper and dill, you have yourself a fantastic, colorful & delicious vegetable side to feature on your Thanksgiving table. Often an overlooked side dish, this humble root can certainly hold it’s own center stage should you wish to prepare a vegetarian meal. 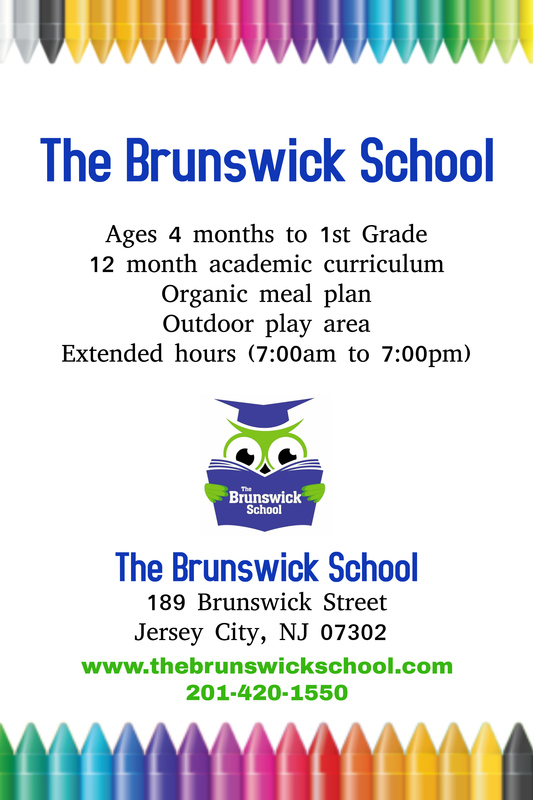 The recipes below are supremely scrumptious and simple, healthy options, great for the days before the big feast. Eating too much meat is not healthy for he waist line or heart and we could all benefit from a few light meals during the holiday season. 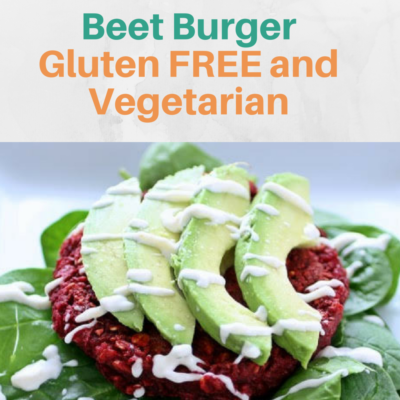 This beet burger recipe will be sure leave you feeling satiated and satisfied without the burger bloat from it’s conventional counterpart. 1. Pre-heat the oven to 400 degrees. Place the beets onto a large lined baking sheet and drizzle with a little bit if olive oil and season with a pinch of salt and pepper. Roast beets for about 40 minutes, until they are cooked through. Let cool. 2. 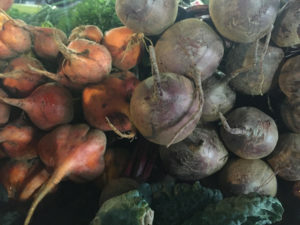 While beets are roasting, quickly sauté the onions until soft over medium heat 7-10 minutes, then add garlic and sauté additional couple of minutes until garlic is soft. 3. Add the beets, chickpeas, quinoa, dill, balsamic vinegar, garlic, onion, salt, pepper and raw egg to food processor. Process for about 15-30 seconds until everything is mixed and just combined into a rough texture, do not over blitz into a puree. 4. Form the mixture into patties, you will get about 6-8 depending on how big you make them. Place patties on a large lined baking sheet. Place in the refrigerator for at least 30 minutes (or freezer for about 15 minutes). Firm chilled patties will handle the heat better and help to ensure they maintain their shape when being cooked. *while burgers are chilling, prep the yogurt dressing. 5. Place a large pan over medium heat and coat the bottom with EVOO and cook for about 3-5 minutes on each side. 6. 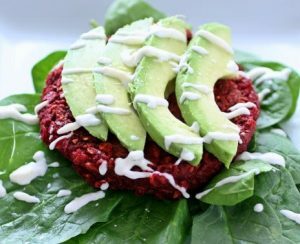 Place a handful of fresh greens on plate, drizzle greens with EVOO and pinch of salt, top with the beet burger, sliced avocado and the lemon yogurt sauce. This dish a nod to my Easter European roots. Being half Polish, buckwheat (or kasza) was a staple in my house and my Babcia (grandma) growing up. It’s truly a delicious nutrient dense grain that’s packed full flavor (also gluten free). 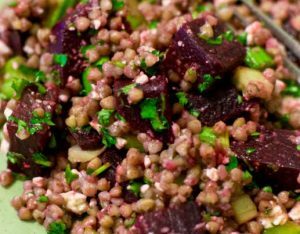 Being a lover of both beets and buckwheat, it occurred to me they may just be a perfect match, indeed my hunch was accurate. This is an earthy, hardy warm salad that packs a punch of flavor while also filling the belly and exciting the taste buds. Combine above ingredients, stir to combine, dress and season to taste. Up next – Mid week squash recipes. Previous Previous post: Brussel Sprouts – a family favorite!